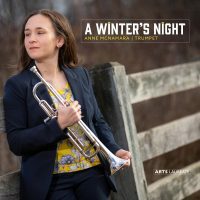 Sonata for Flugelhorn and Piano (2015) was written for and is dedicated to Anne McNamara. The work was commissioned with support from the University of Utah and Campbellsville University and a trumpeter consortium. The stated intent behind the commission was to develop a work of serious content for flugelhorn that explored the range of possibilities of the instrument: not only its characteristic warm lyricism, but also its technical and virtuosic possibilities. The work employs the “Cantus/Ludus” form that I have used in several of my instrumental sonatas over the years. The two movements are balanced in their emotional affects and together thus explore a very fundamental musical and cultural dichotomy. In general, the “Cantus” movement concerns itself with song and the “Ludus” movement with play, but these boundaries begin to blur. Thus, while the “Cantus” movement develops largely lyrical material, it does so with a distinctly nervous energy. Finally, at the end of the movement, we get the song-like material presented unhindered. The “Ludus” movement becomes a game of rhythm and harmony—it is a series of little journeys to and away from triadic material.